This site has been a major project for STCV over the last two years. This is a privately owned site which is the last part of a once larger farm where most of the land has been lost to the M26, sand extraction and development. The remaining fields are an area of unimproved acid grassland. The owner has been granted funding under the countryside Stewardship scheme to protect the bio-diversity of the field. 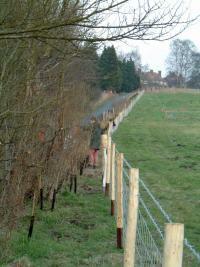 The current work is to re-establish the field hedges which have been lost due to Dutch Elm disease. 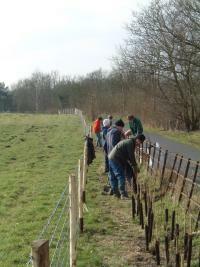 STCV carried out four tasks in 2003, first to clear the majority of the dead wood from the hedge, then to plant over 600m of hedge and mulch the plants to suppress weeds. 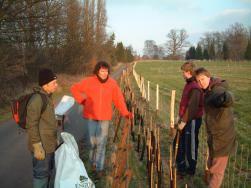 In 2004 we returned to clear around the planting and apply more mulch. The work has been successful and the majority (85%) of the planting survived the dry summer of 2003 to show into leaf in the wet cold spring of 2004. Addington is a fascinating site unimpressive perhaps at first glance but rich in detail. At one end evidence of mans long occupation is a Long Barrow and the remains of a dolman in the garden of the owners house. Another chance to check on the progress of our 2003/04 project hedge which surrounds this acid/neutral grassland meadow. A small team of volunteers tackled the brambles, nettles and long grass which continue to outgrow the young hedge plants. Some of last years bark mulch is still evident and the hope is that this year we can get away with hand weeding just once in late spring. It was interesting to see how the hawthorn and field maple have survived in the light soil, with dogwood less vigourous at this stage. This winter we hope to 'beat up', that is fill in the bare areas where the planting did not survive the very hot summers. The final choice of species yet to be decided!"